July 2015 Investment Commentary – Greece, Commodities and Future Growth - Financial Symmetry, Inc. The month started with concerns over a Greece exit (“Grexit”) from the euro zone, but was averted by a last-minute deal. Although Greece accounts for a small amount of the euro zone’s GDP (less than 2%) an exit would question whether countries would leave during a crisis which could impact the credibility of the single currency. Commodities continued to fall during the month of July by about 10% and approx. 30% over the last year depending on the index used. A combination of oversupply and soft global demand has impacted worldwide commodity prices. We have an article on gold below explaining the long term fluctuations in gold prices. 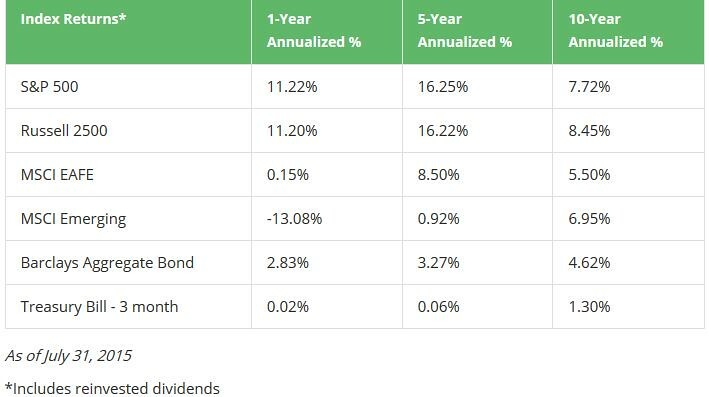 The one thing to remember with commodities is they do not pay a dividend or interest payment like stocks or bonds so the price depends on what someone else is willing to pay. 2nd quarter US GDP was released at 2.3% growth which was a little slower than expected. The growth was primarily driven by the consumer which accounted for over 90% of the number as business investment impact was minimal. Eyes remain on the U.S. Federal Reserve and whether they’ll raise rates in September. Emerging market stocks have declined approx. 13% over the last year as the chart indicates driven by the decline in commodity prices, strong U.S. dollar, China economy slowing and the expectation of higher U.S. interest rates. That said, based on estimated price-to-earnings ratios, the emerging markets are trading at their biggest discount to developed markets since 2006 – 31 percent. Overall, we remain concerned regarding US equity and bond valuations as we have gone 45 months without a stock market correction of more than 10%, the third longest on record. But there are opportunities in international markets as relative valuations remain attractive. Even still, we know there will be a correction at some point – the question is when. Where is Opportunity in a Low-Return Environment?